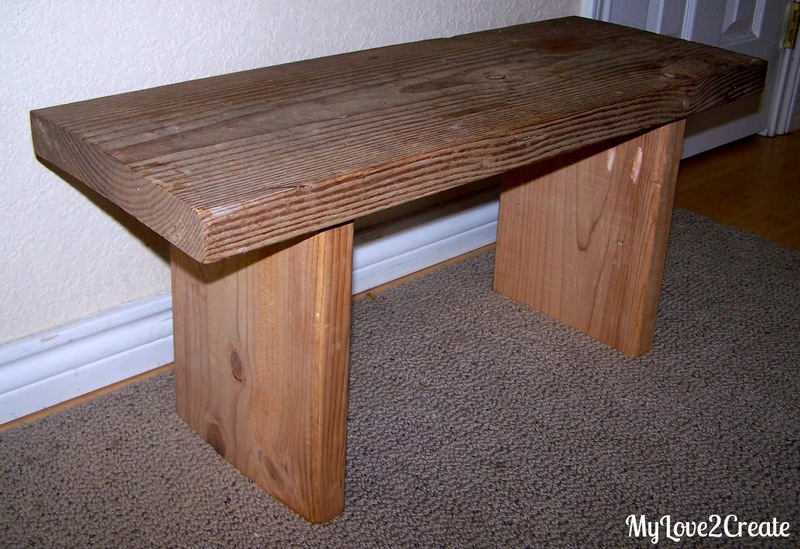 So let me tell you how this simple bench came to be. On Halloween day, we decided to carve pumpkins and I wanted to put out the free jack-o-lanterns I had gotten earlier this year....but they needed something to sit on. We were short on time, I knew I had a great piece of wood I had picked up from someone's trash that was in the garage. I grabbed it and went out the shed to find something from my horde stash. I found two pieces that were exactly the same height....Perfect! So last night in twenty minutes or less I put it together. I know the time because when I decided to do it I had a half an hour before I had to pick up the boys from wrestling....and I was on time! 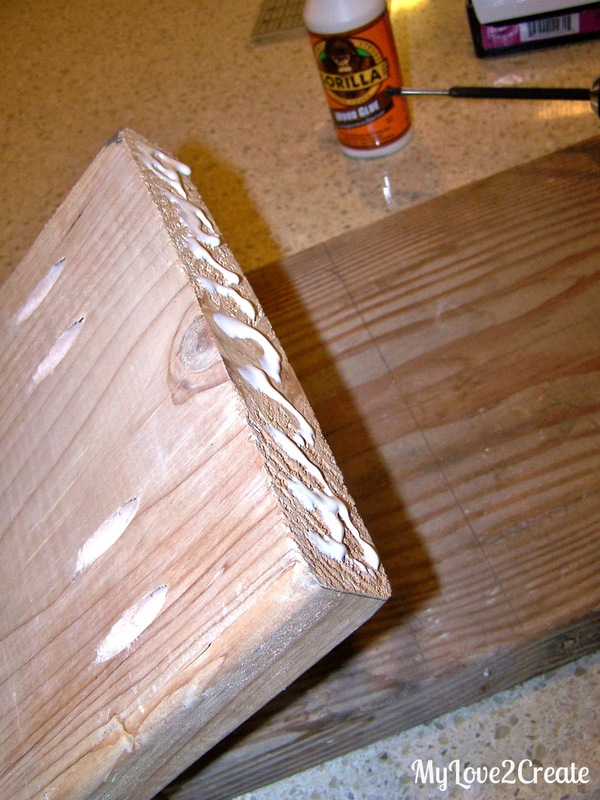 If you make one, make sure you have boards that are thick. 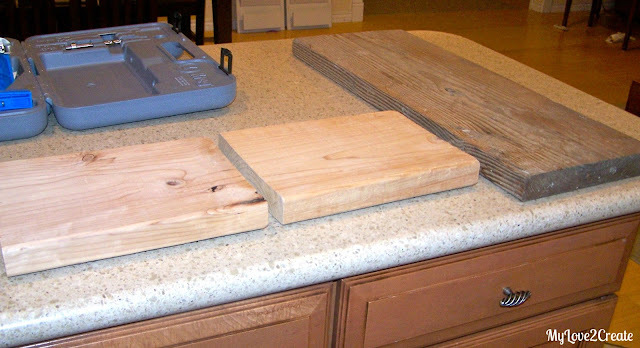 If you do not have a saw or wood you can get it at Home Depot or Lowes and they will cut it for you! Make sure to check the cull bin at home depot for wood that might work....It is really cheap, like 51 cents a board, but sometimes they don't have a good selection. It is worth it to check though....I always do! I just went with these measurements because they were what I had, but you could modify to what you want. Next, I used my Kreg Jig to drill pocket holes. Pocket holes make the joints really sturdy and they are worth it for a strong bench. 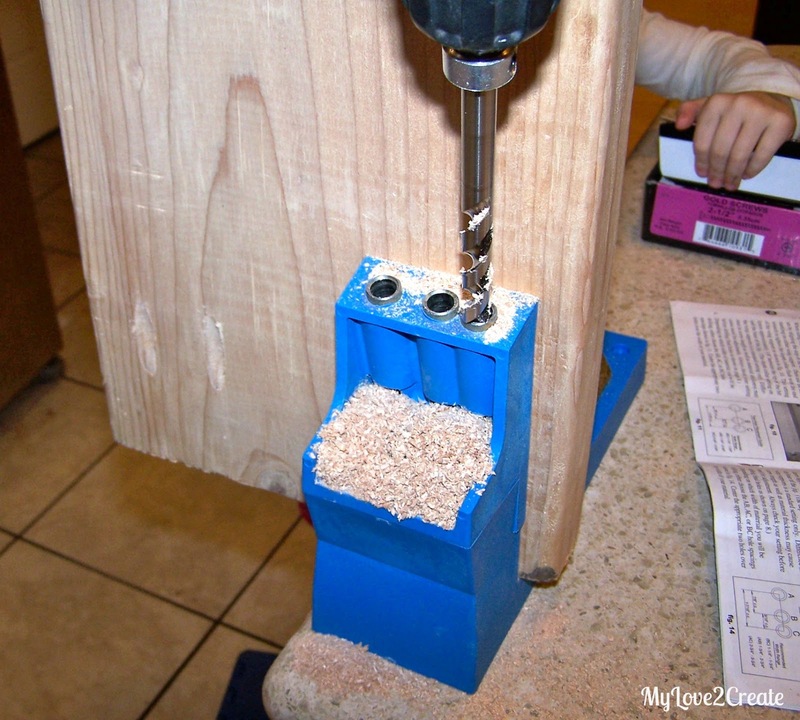 If you don't have a pocket hole jig, you could drill countersink holes into the top of the seat and into the legs, if you choose this option it would probably be a good idea to use L brackets underneath for added support! Next you want to glue.....but make sure you know where you want the legs to go. Before I applied the glue I measured 4 1/2 inches from the ends of the long board and then set my legs on and traced the leg on the board. That way, as you can see above, I know exactly where to put my board after it is glued. Much easier that way. Next all you have to do is screw! 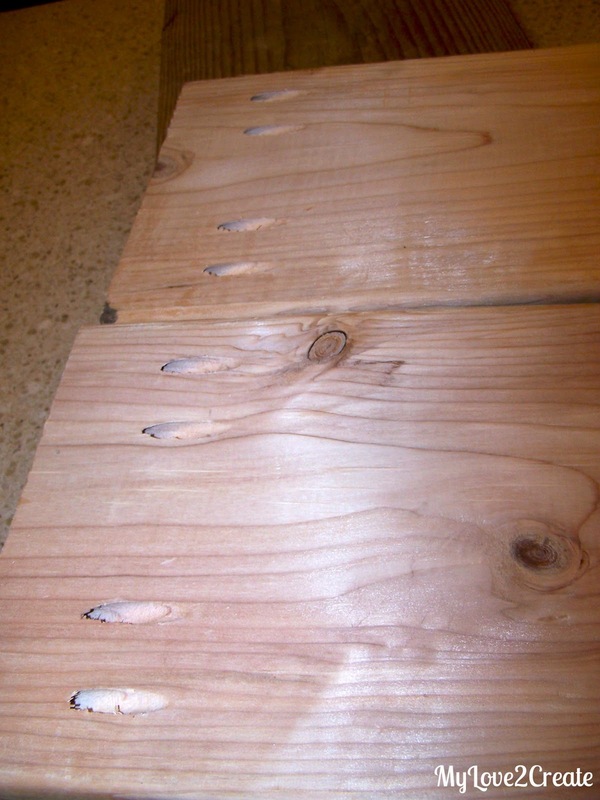 I just want to note that since this is not 3/4 inch thick wood, it is 1 1/2 inches...then you need to drill the correct size pocket holes and use 2 1/2 inch screws. 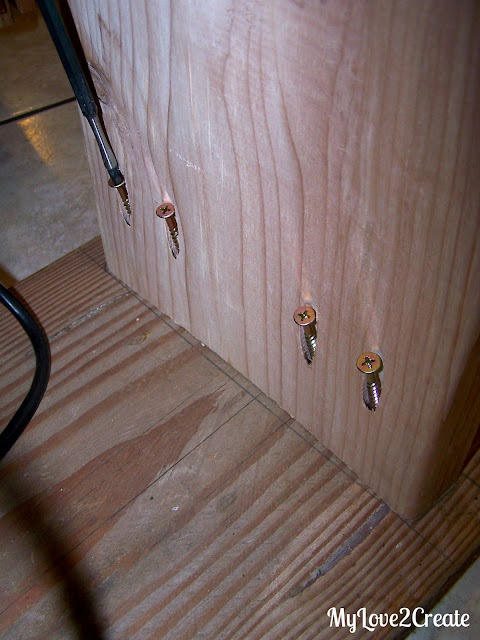 I do not have pocket hole screws that size so I just used wood screws. You can also see the boards I used were not exactly straight. I like to use what I have. 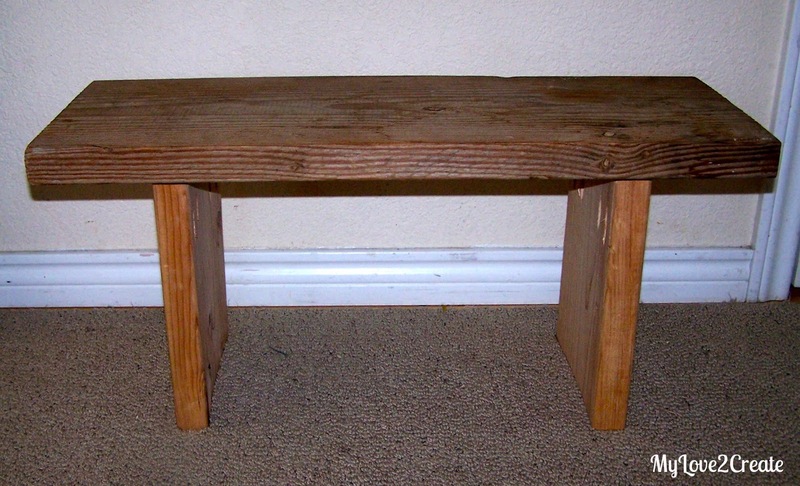 I do not have a very strong upper body, so I moved the bench to the floor and used my body weight to hold the board down and then screw it in. If the screw doesn't go all the way in, joining the boards flush, reverse your drill and unscrew each screw. Then screw them back in. This happened on both legs, possibly because I didn't use pocket hole screws, but they went together perfectly the second time. Can you see the pocket holes? You could fill them in with wood plugs or wood filler, but I just left mine, I was going for the rustic look anyway. 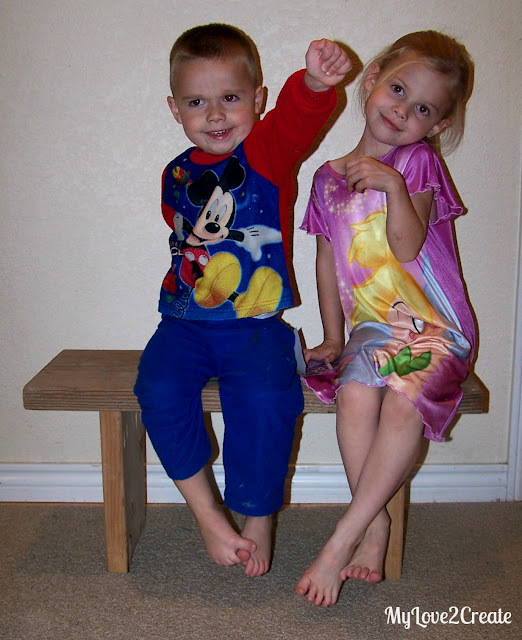 My kids LOVED the bench! It actually held my husband sitting on it and my 12 year old standing on it at the same time! Gotta love those pocket holes. Seriously I think it has taken me three times as long to write this post as it did to make the bench! 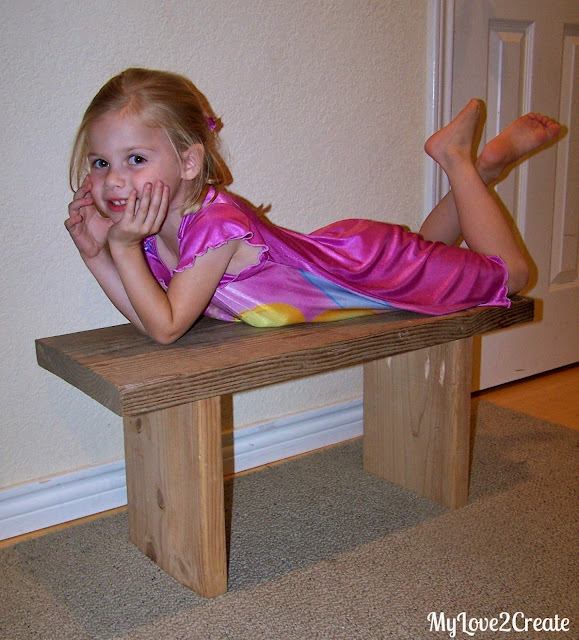 I plan on using it as a display bench, but it is perfect for little kids! It would be super cute painted in a fun color, for the kids rooms! 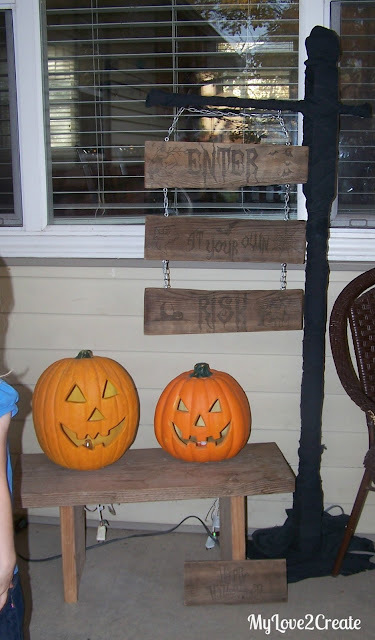 My kids and I had a lot of fun making a display for the bench, we are getting excited for Thanksgiving! 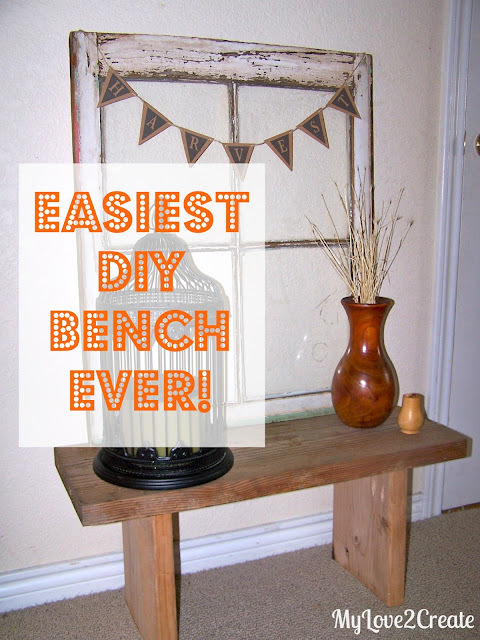 I hope you are inspired to make your own bench! It really is simple and cheap and fun! Oh my gosh Mindi, this is soooo cute! 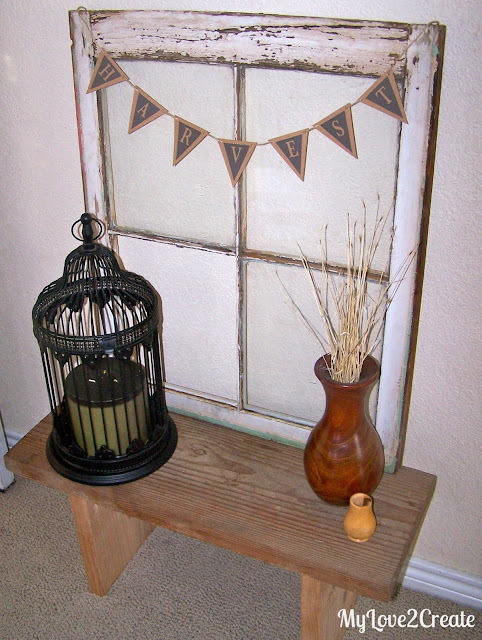 I absolutely love your old window and the cute pennant banner. Missing you! My Abby is sick and so I haven't been able to visit. thanks for sharing at CCC, catching you! Don't you just love that Kreg Jig?! I'm addicted to it! 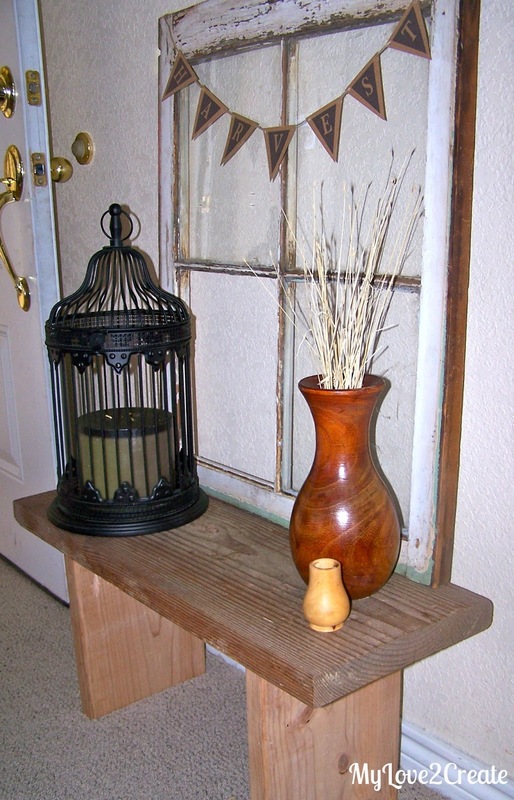 Cute bench, and I love the vignette you created! 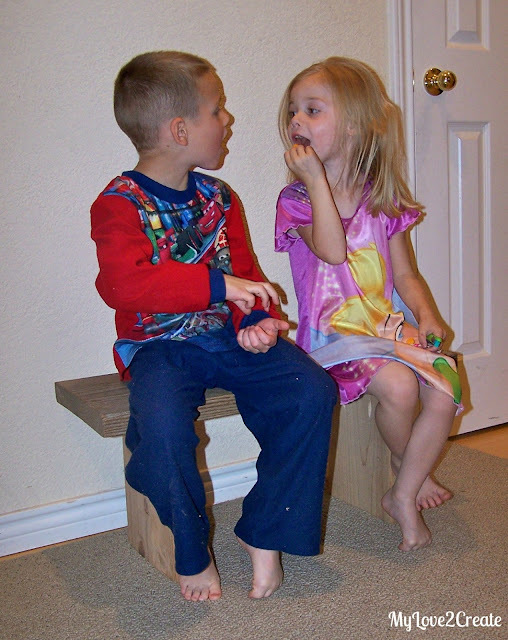 Mindi, The little bench is adorable and your children are so cute. I love the window frame and the banner too. Thanks for partying at the Open House party. Thanks for linking up to my Pin Me Party! I've pinned this! Have a wonderful Thanksgiving!